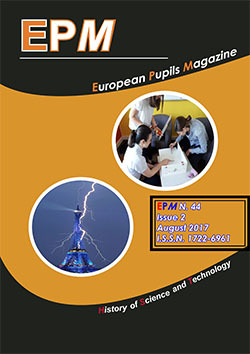 The last EPMagazine issue has been published as well as the EPMultimedia CD Collection 2003-2011. In http://epmagazine.altervista.org you can find the August 2011 last issue of. In http://epmcd.ath.cx you can find last EPMultimedia CD Collection 2003-2011 edition. Here is the Fagaras/Brasov 16th EPMeeting draft timetable. In www.mediafire.com/view/?8x9y6wlk6lur9p9 you find the Fagaras/Brasov 16th EPMeeting temporary timetable. Send articles to be published next issues. If you (either teacher or student) want to publish articles or other kind of contributions to HST EPMagazine, feel free to contact us by email epmagazine.it@gmail.com. We remind you that the contributions have to be original and must not have been published or being currently under consideration for publication elsewhere. Papers must be the result of either personal research or group practice in the covered topics, always about History of Science and Technology (HST) Technology for Green Energy (TGE) seen through its historical-developmental point of view. Useful links and mail addresses. See also our participants page. You may join us as Editorial Member, Co-operator or Contributor. If you want to be member of EPMagazine scientific-educational project, here you find a short explanation about the activities to perform: EPM Editorial Board Member means to be a full part, with economical and technical responsibilities about every kind of tasks and activities needed for the editorial work (managing to publish one issue a year, at least, included). The EPM Editorial Board Member’s activities include everything performed both by Co-operators and Contributors, too. EPM Co-operator means to be an EPMember helping in any way the EPM Editorial Board (i.e. : organizing meetings, to help/find economical support, enlarging the list of effective co-operators, contributing with articles, and so on), excluding to publish the issues, arranged by Editorial Board, only. The Co-operators perform the activities required to Contributors at the same time. EPM Contributor means to submit articles, news and fun pages during all year round.